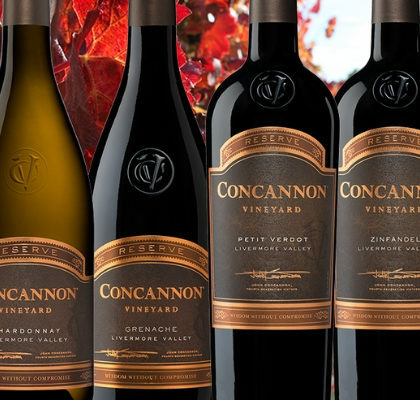 As our 135th harvest comes to a close and we prepare for what 2019 has in store, we wanted to take a moment to pay tribute to the best wines of 2018 as decided by our very own Concannon team. We’ll take you through each wine, tasting notes, pairing recommendations, and more. Did you have a favorite wine or a favorite estate event? Leave your vote in the polls! Tasting Room Manager, Lori Albiani’s pick for the best wine of 2018 is our 2015 Reserve Livermore Valley Chardonnay. This bright Chardonnay boasts aromas of stone fruit, citrus, and a fresh-picked bouquet of flowers. This balanced wine is known around the winery to be an all-around crowd-pleaser, and an exceptional wine for most any pairing. Pair this wine with angel hair pasta tossed in lemon pesto or grilled halibut with sautéed stone fruits. Wine Specialist, Jaque Forrest’s pick is our 2015 Reserve Livermore Valley Grenache, which comes from some of the finest of grapes picked from our Ruby Hill and Carter Vineyards, with light blending from Petite Sirah, Malbec, and Syrah all grown in our Estate Vineyards. This wine is aromatic and earthy, with delightful fruit flavors and hints of smoked oak and rich chocolate. Prepare for a long, smooth, sinfully delicious finish. Enjoy our Reserve Grenache with smoked pork ribs and cheesy polenta. 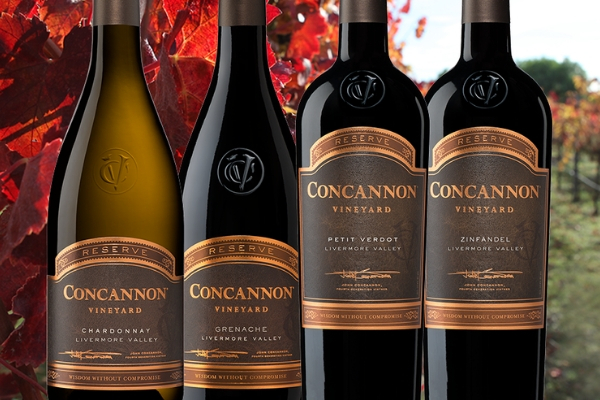 Fourth Generation Vintner, John Concannon’s pick is our 2015 Mother Vine Cabernet Sauvignon. This wine is rich with berry flavors, hints of licorice, and notes of baking spices. Full-bodied and chock full of tannins, this wine with best enjoyed with BBQ ribs, peppercorn steak, or a Bleu cheese burger. Winemaker, Alyssa Barber’s pick for the best wine of 2018 is our 2016 Reserve Zinfandel. This wine is generous on the palate with complex layers of berry jam, violet aromas, and hints of vanilla bean, closed by a smoky, peppery finish. Pair this wine with smoked cheeses, pork ribs, or spicy flank steak. Estate Sommelier, LeeAnn Kaufman’s pick is our 2015 Reserve Petit Verdot. This intricate red boasts firm tanins, dark berry flavors, hints of spice, and a long, smooth finish. This wine is best enjoyed with maple bourbon bacon ice cream, braised lamb shanks, or flatiron steak. Winemaker, James Foster’s pick for the best wine is our 2016 Crimson & Clover Red Blend, a bold red wine blended from Mourvedre, Petit Verdot, and Merlot sourced from our Polo Field Vineyard and Madden Ranch. This wine is complex in texture and flavor, offering a rich, full-bodied mouthfeel and bright notes of cherry and blackberry. The wine closes with layers of coffee, vanilla bean, and mocha, perfect for cold winter nights and crisp fall days. Pair this wine with Humphry Slocombe Black Sesame ice cream or dishes bursting with bold flavors. We want to know your favorites, too. Voice your opinion by casting your vote for the best wine of 2018! Cast Your Vote for the Best Wine of 2018! We want to hear from you. Let us know your favorite of the nominated wines below! 2018 was full of wonderful moments at the estate. From Estate Sommelier, LeeAnn Kaufman’s creative, hands-on events to our bountiful 135th harvest, 2018 gave us so much to be thankful for. Did you have a favorite event that you attended at the estate this year? Let us know by casting your vote below. Did you have a favorite Concannon Estate event that you attended this year? We’d love to get your thoughts on the events that went on at the estate this year!